For any business, digitization is crucial. It could be with integrating new software and applications to the business processes or upgrading the existing corporate network to enterprise Intranet. With ever expanding business locations and introducing remote work culture, the need to stay connected and collaborate has become even more essential. The last decade has witnessed a massive transformation in digital technology. Enterprises are taking a paradigm shift to adapt to this new change. Through digital workplace, organizations give choices to their employees to experience the new digital age. Employees now acknowledge how it can transform their work dramatically by allowing them to work from different locations with the help of bleeding edge technology. It’s also very important for the organizations to ensure this platform works effectively – a platform that connects people and let them engage and collaborate irrespective of their geographical locations. Organizations are not only successfully transitioning into this future-proof digital transformation but they also help their employees maintain a better work-life balance. They are signaling them how they care about them thus boosting employee experience which eventually leads to customer experience. Employees, on the other hand, are very well attuned to those signals, that’s why things like remote working design matters that indicates how much concerned you are for their well being and expectations. When you’re done reading this post, you also have a look at this – A great blog post that talks more elaborately on how digital workplace is driving employee experience. Why is digital workplace necessary? If we roll back 20 years, the idea that organizations would create physical environments for people to work in would be such like holistic uplifting places would be just seen as money wasted why would we bother, where does this transformation come from? We think this is about whole culture of the world. Human beings get much more appreciation as a single person. In traditional physical office space, there are lots of people and nobody cares about single persons, it was a mess of employees and not very individualistic. Now with the proliferation of digital workplace, world is becoming much more individualistic and it’s giving much more attention to individual people. With rapid upsurge in the IT expansion and thousands of start-ups being established every year, there is not much loyalty left. It therefore becomes imperative for the organizations to take care of their employees and retain good talents for achieving their business goals. These days employees quite only after being 1-2 years in the organizations. The employers should think what keeps them in their jobs. This is where enterprise enterprise Intranet come to their rescue. Where does the whole issue of cultural and regional differences lie in a workplace that works in countries like Germany, China, India etc. There are important basic elements of a good workplace found across the globe. You need to sort of tune two elements for the local culture for example – all over the world people need to feel they have comfortable level of control over their physical environment that might be the ability to open a window, adjust lights or sit comfortably on bean bags and do their work – there are overwhelming number of choices. They want something that could change their working style. Even if you have the right amount of elements, you need to tailor them based on their cultures for example – in more individualistic culture, people more actively take advantage of those opportunities you provide to control their environments so you will have to make sure they exercise control without creating an ugly space. Digitlization has also transformed the traditional physical workplace with the help of two important trends – enterprise Intranet and collaboration tools. The recent proliferation of the enterprise digital workplace has compelled the organizations look deeper for a competitive advantage and induce a strategic fit that boosts customer experience, ensures employee retention, reduces costs and time involved to develop and market their products/services. Collaboration tools play a vital role in the success of the newly integrated enterprise Intranet. Social Intranet features like instant messaging, project management applications which assist HR, sales, IT, accounts etc. and features that help break down employee communication silos. The new age Intranet platform is also intelligent enough to give immediate solutions to the end-users spanning various departments, thanks to the inception of the AI technologies, chatbots etc. The key to successfully replace the conventional physical office with the advanced enterprise digital workplace lies in the practical implementation of the digitization strategy that is capable of driving revolutional workplace cultural change. News Feed: Corporate information such as win announcements (new client/project acquisitions), policy changes, events, memos, leadership etc. Workflow: This fantastic feature has the ability to automate all HR-related queries and requests such as leave requests, employee appraisal evaluations, booking conference rooms etc. Increased employee productivity: With the help of collaboration tools and digital channels, direct communication takes place among the workforce, stakeholders and partners, thus ensuring engagement and increase in productivity. Increased employee retention: Collaboration leads engagement, thereby motivating the employees to perform better and getting acknowledged for the same, thus the retention goes up. Increased talent attraction: The newly adapted workplace culture providing facilities such as work flexibility coming from the enterprise Intranet, helps attract the best talent especially the millennials. They prefer to be free from the typical 9 to 6 physical cubes and give their best creativity to organizations by working remotely. Increased satisfaction: Well, this is a no-brainer, as employees have the privilege of having control over their physical work environment through full Intranet connectivity and communication, they are happy at work and off work. Increased compliance and governance: Because of the remote connectivity, today the burden on the IT administration has reduced drastically, no need for physical presence of help desk. The potential benefits of digitally enabling both the workforce and the employers mean that organizations will go a long way in satisfying their end customers, which is the very purpose of being in the business. 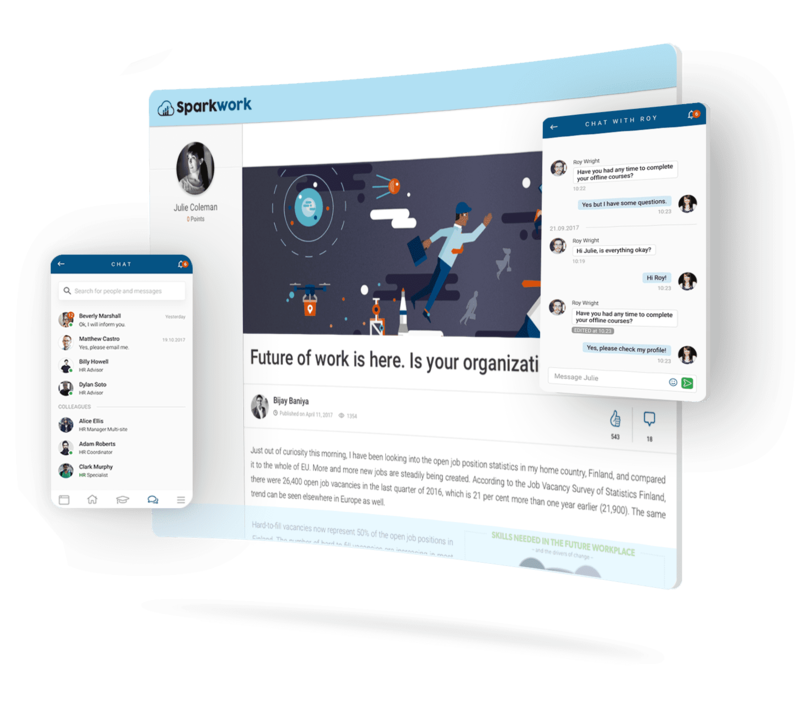 At Sparkwork, we strongly believe change is the only constant and hence we keep on evolving the enterprise Intranet features that help employees stay more connected. You can request for a free demo here.